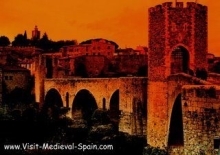 In creating this site we hope to share our passion for Spain and all things medieval. We've tried to include a wide range of information which will be useful to both independent travellers and history buffs. You'll find information about well known monuments such as the stunning Alhambra Palace in Granada as well as the less well known small villages which are off the beaten track and manage to maintain a truly medieval air. There's also a selection of travellers tips, how to get there , legends, history and background information etc. So whether you are looking for ideas for an interesting day trip, a weekend away, or plan to spend your entire holiday discovering medieval Spain we hope that this website will provide you with the information you are looking for. So, What exactly do we mean by Medieval Spain ? When we talk about about Spain, the medieval period is generally considered to have started with the fall of the Roman Empire in the fifth century A.D. and ended with the final stages of the "Reconquista" in 1492 which saw the end of over seven hundred years of occupation by the Moors and the discovery of the Americas by Christopher Columbus. A period of battles, struggles and alliances between the kingdoms and dynasties which finally became Spain as we know it today. Evidence of this exciting period of history can be seen today throughout Spain. This evidence takes many forms; from castles, palaces and walled towns to streets named after famous knights, kings or battles and the many Spanish words and place names which are of Arabic origin.